House fires can happen at any time of the year. Just like bush or grass fires, the key to surviving a house fire is being prepared. Most importantly, have an adequate number of suitable smoke alarms installed throughout your home and make sure that you test them regularly. Change the battery at least once every 12 months. Make sure you and all your family know two safe ways out of every room in your home. 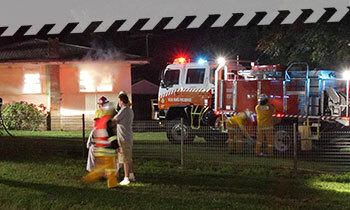 Have a written home escape plan in case of fire and practice it regularly. Never ever leave cooking unattended. If you have a fireplace in your home make sure the chimney is clean. If you have a fireplace always place a screen in front of it when in use. Check electric blankets for damage or frayed cords before placing on the bed. Take care to keep curtains, tablecloths and bedding away from portable heaters. Keep wet clothing at least 1 metre from heaters or fireplaces and never leave unattended. If you use a clothes dryer make sure you clean the lint filter each and every time you use it. Only use one appliance per power point and switch off at the power point when not in use. Always extinguish candles or any other open flames before going to bed. Never leave candles or any other open flames unattended. Always handle candles or any other open flame with care. Store matches or lighters in a secure place not accessible to young children. When asleep you will not smell smoke and it will in fact put you into a deeper sleep. If you have escaped from a home fire, remember once you get out stay out and dial Triple Zero (000). Oil, gas or wood heating units may require a yearly maintenance check. Only ever use fuses of recommended rating and install an electrical safety switch. For more information on making your home safer from a house fire, download the Is Your Home Fire Safe Fact Sheet or visit the Fire and Rescue NSW Home Fire Safety website.